SysExporter: Added support for drag And drop feature – Allows you to easily locate the desired window simply by dragging the target icon from the SysExporter toolbar into the window that you need to grab the data. Mail PassView: Added support for Windows Live Mail. PasswordFox: Added new option in ‘Select Folders’ dialog-box: Remember the folder settings in the next time that you use PasswordFox. Dialupass: Dialupass now also locate the phonebook file even when the ‘Application Data’ folder is in non-english language. Added ‘Cleal All Filters’ option. Added ‘Include Selected Processes In Filters’ option. Allows you to easily filter by selected processes. Posted by NirSoft on January 26, 2009 at 3:28 pm under Utilities Update. This email offers a new Home Planner software from IKEA , and ask the user to follow the instructions in the attached zip file. But the attached file contains a Virus that probably continues to spread this “New Planning Software” message to more and more users. IKEA has a Fantastic new FREE tool for home decorating. Introducing our Home Planner software which allows you to plan your home in a 3D environment. Simply follow the instructions in the attachment and start planning your dream home today. Posted by NirSoft on January 15, 2009 at 2:16 pm under Internet Scams. 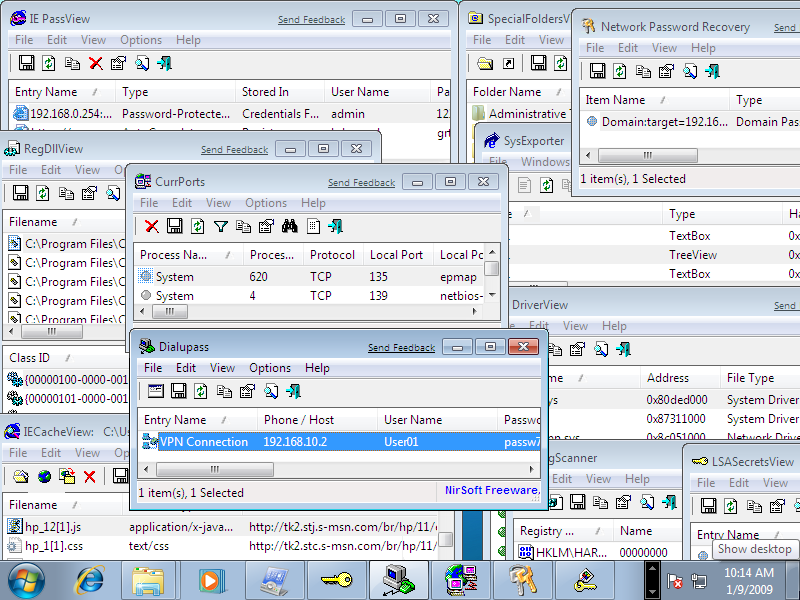 I just tested a few of my utilities on Windows 7 Beta. 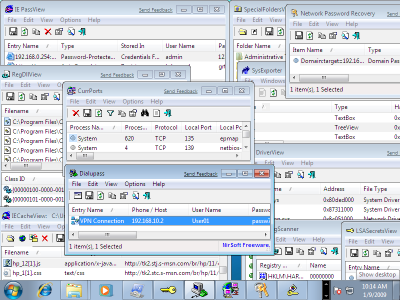 The test included IE PassView, IECacheView, Network Password Recovery, SysExporter, RegScanner, Dialupass, CurrPorts, DriverView, LSASecretsView, and more. Posted by NirSoft on January 10, 2009 at 2:18 am under Uncategorized. Added new command-line option: /LoadConfig – Start SiteShoter with the specified config file. Added new command-line option: /RunConfig – Take a screenshot according to the specified config file, without displaying any UI. Added new command-line option: /LoadConfig – Start ResourcesExtract with the specified config file. Added new command-line option: /RunConfig – Extract resources according to the specified config file, without user interface. Added new option: ‘Create .Reg File For Deleting Entries’ – Allows you to create a .reg file that will remove all entries of the selected registered files when you run it. This option can be useful if you want to clean the same registered files in multiple machines. New option: Bring process to front. Posted by NirSoft on January 4, 2009 at 1:50 pm under Utilities Update. nirsoft.net statistics: Almost 30% of visitors use Firefox Web browser. Since I started to collect general statistics about Web browser usage of nirsoft.net, 4 years ago, there was a gradual increase in usage of Firefox, while the usage of Internet Explorer gradually decreased. According to statistics of the last month (December 2008), 29.2% of nirsoft.net visitors use Firefox as thier Web browser, while 55.8% of visitors use Internet Explorer. For more nirsoft.net statistics, click here. Posted by NirSoft on January 1, 2009 at 2:10 pm under Uncategorized.